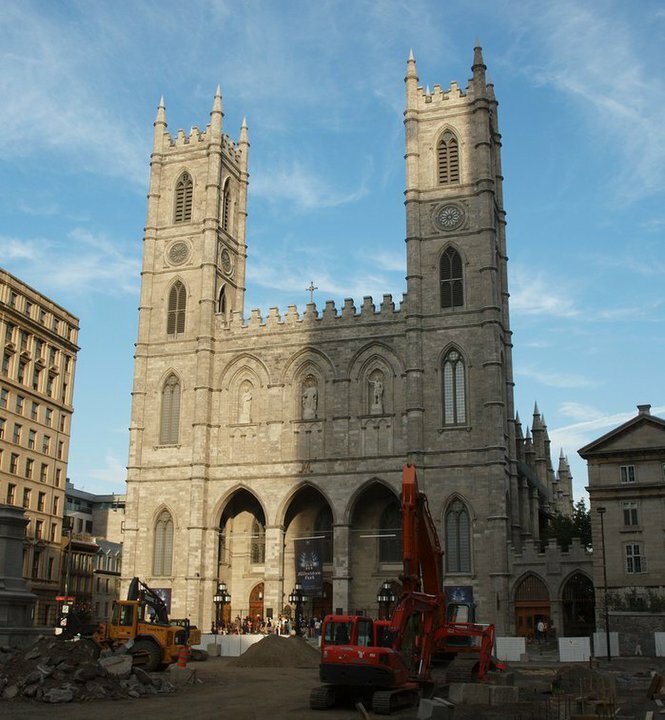 The Notre-Dame Basilica (Basilique Notre-Dame de Montréal) has nothing to do with its namesake cathedral in Paris to which it bears a slight resemblance. It is, however, a beautiful and historically significant house of worship in its own right. 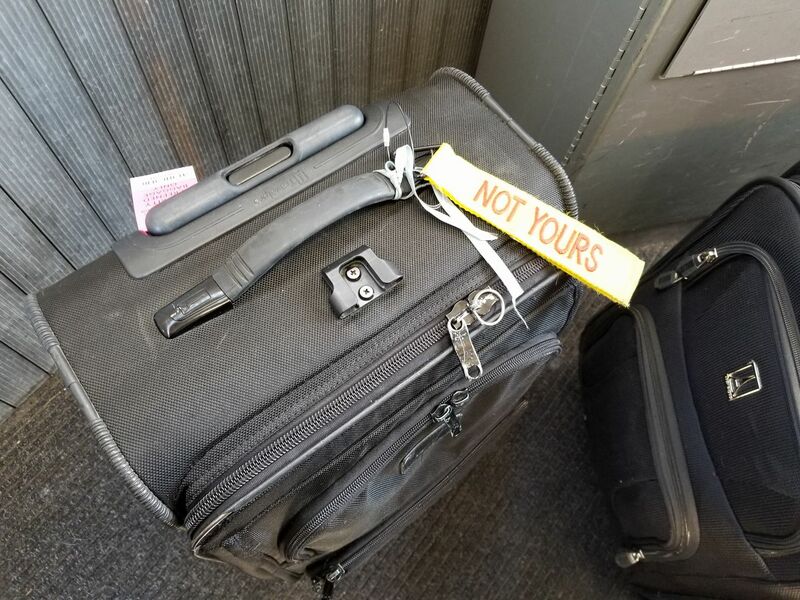 This post will differ from most others on this blog, in that it’s more in the style of a memoir telling a story – a story involving events that occurred all the way back in August 2010. I was making a weekend visit to Montreal, partly because I was interested to see that city for the first time but also partly because I had (to that point) sung in 17 countries and I felt it was about time that I karaoked in Canada. In fact, upon arriving at Montreal’s Pierre Trudeau International Airport, I joyfully declared to the immigration agent that the purpose of my trip was to add Canada to my World Karaoke Tour. 🙂 (He seemed a little confused, but allowed me to enter the country.) So this story is about whether, that weekend, I would succeed in my quest to karaoke in Canada for the first time. By the time I got checked into my hotel in Montreal, it was late on Friday night (about 11 pm) and I was too tired to go out. So I took it easy. While I thought about looking for karaoke immediately, I decided that I could wait one more night for my initial singing appearance in the land of maple leaves. But would that initial appearance end up happening? 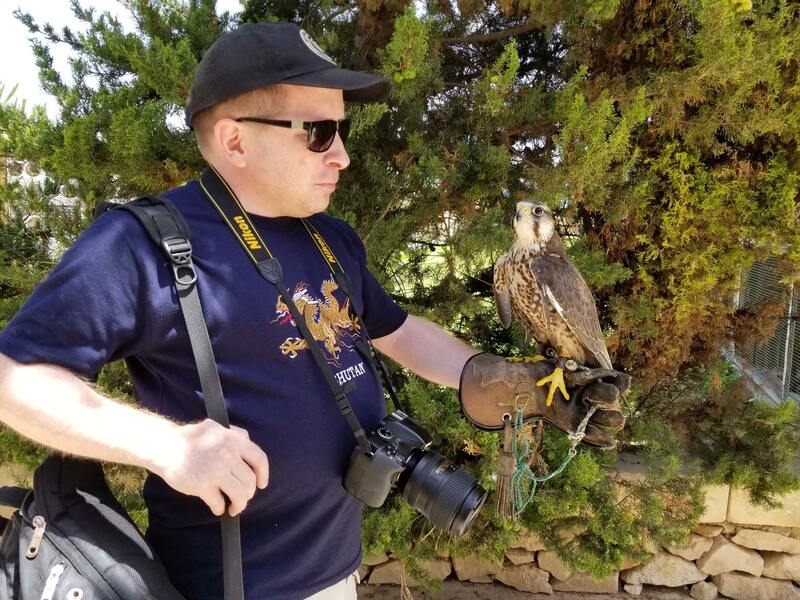 Me with a Maltese falcon at a falconry centre on the island of Malta. Yes, I’ve been sadly derelict in keeping this blog up-to-date. As I dispatch this post into the interwebs, the tally of countries in which I’ve karaoked stands at 59. There’s work to be done to catch you, my loyal readers, up on my adventures. That work starts now, as I reminisce about a trip that took place in July 2017. Prince Harry was still over four months away from proposing to Meghan Markle when that trip took place. To reach the half-century mark for countries in which I’ve karaoked, I wanted to choose somewhere special. The nation that I settled upon was the Mediterranean archipelago of Malta. That tiny but picturesque and history-rich country turned out to be a spectacular selection. Malta was like nowhere else that I’ve been to. And in addition to enjoying an idyllic vacation there, I did reach the milestone of 50 countries on my World Karaoke Tour. Malta consists of three inhabited islands – Malta, Gozo, and Comino (rendered in Maltese as “Kemmuna”), in descending order of size; and a smattering of unpopulated isles. I lodged on the island of Malta and also day-tripped via ferry to Gozo. The archipelago is situated in the middle of the Mediterranean Sea, some 100 miles south of Sicily and just over 300 miles north of the African nation of Tunisia. 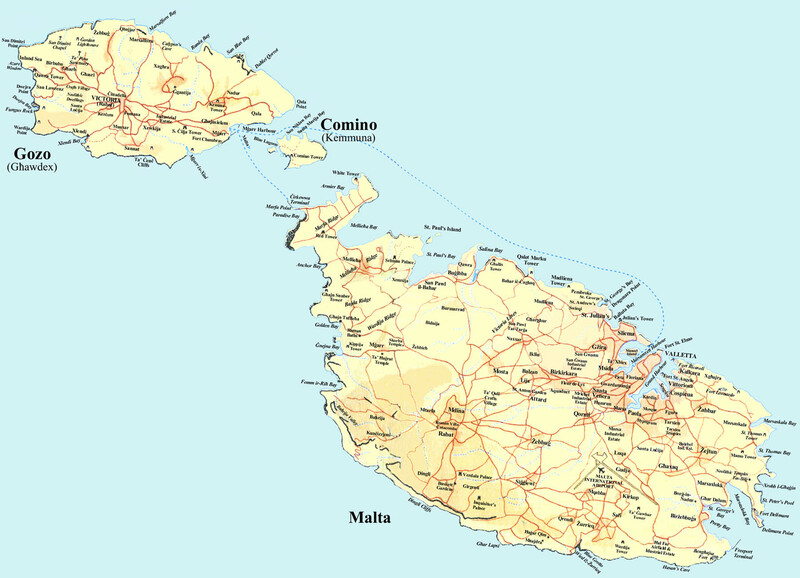 A map depicting Malta’s three populated islands. 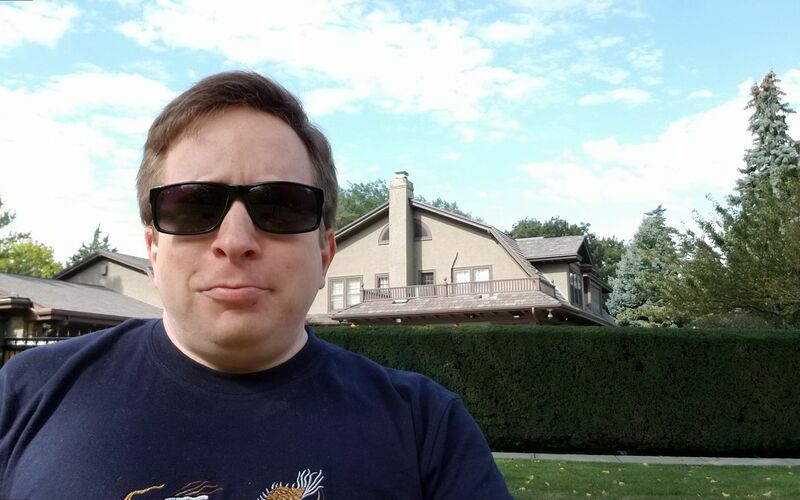 Selfie in front of Warren Buffett’s house in Omaha, Nebraska in September 2017. 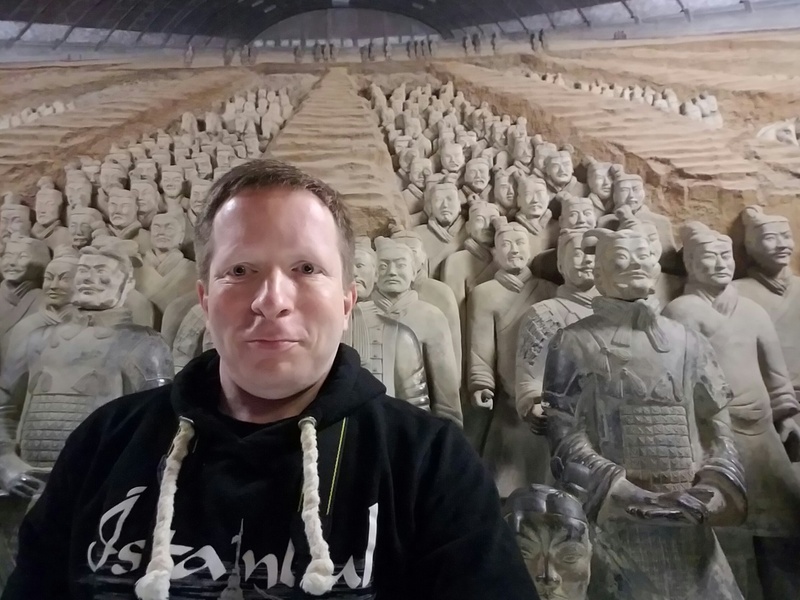 As detailed in this post, in 2016 I continued to place a high value on international travel but added a new focus on seeing more of my own country, the United States – with the ultimate goal of visiting, and karaokeing in, all 50 of its states. Henceforth, I shall refer to that 50-state karaoke project as my American Karaoke Tour – the domestic counterpart to my World Karaoke Tour. In 2017, I took a great leap forward towards completing my American Karaoke Tour. As the world rang in 2017, the tally of U.S. states on that tour stood at 28. Before the year was out, that number would climb all the way to 42. Plus I made some return singing appearances in a couple of additional states in which I’d sung in the past; and I explored a Canadian city that was new to me, thereby experiencing (and karaokeing in) a new Canadian province! 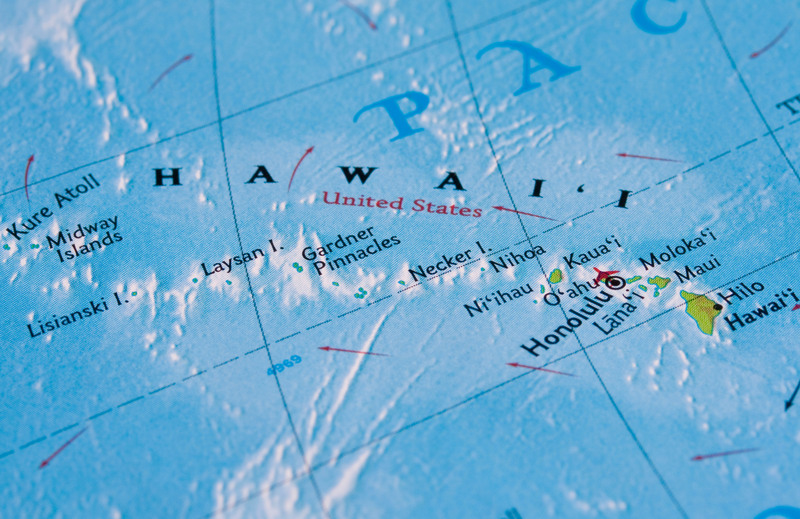 I realize that this blog post is exceedingly long, even though my recaps of particular destinations are quite condensed. Don’t feel overwhelmed; if you’re reluctant to slog through the whole thing, no one could blame you. 🙂 Just scroll down and read about the locations that most grab your fancy. Nor do I expect that you would have the time to view anywhere near all 19 of the karaoke videos that are embedded herein, even if you wanted to; but I do hope you’ll play at least a small sampling of them, to get a feel for what my North American singing experiences were like as I crisscrossed the continent in 2017. If you want suggestions, I can tell you that my own favourite videos in this blog post are of my performances of “Walking in Memphis” (which I sang in Vancouver, British Columbia); “Rock Lobster” (which I sang in Portland, Maine); “Wonderwall” (which I sang in Salt Lake City, Utah); and “Blister in the Sun” (which is the second video that you’ll find in the section on Des Moines, Iowa). 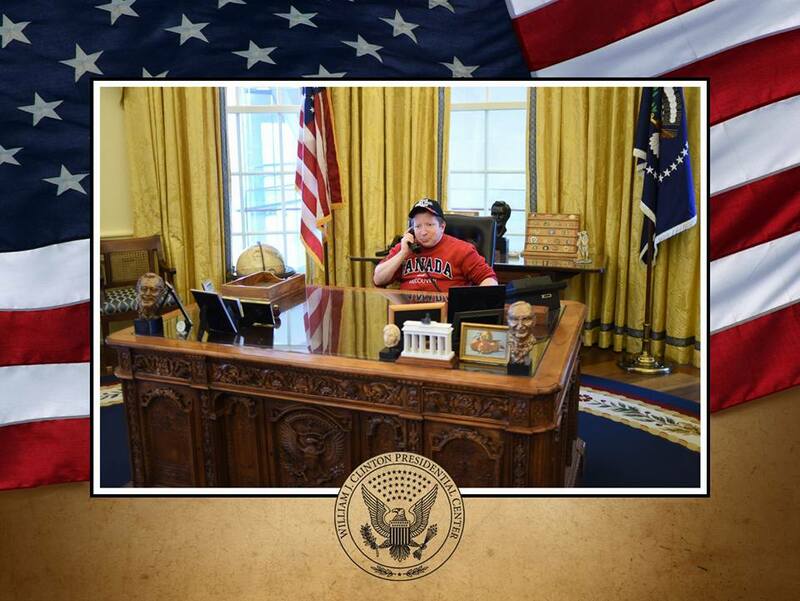 During the long President’s Day weekend that my home country observes in mid-February, I made my first visit to the Canadian province of British Columbia – and specifically, to the city of Vancouver. It didn’t take me long to fall in love with Vancouver, as so many travellers from all over the world have. 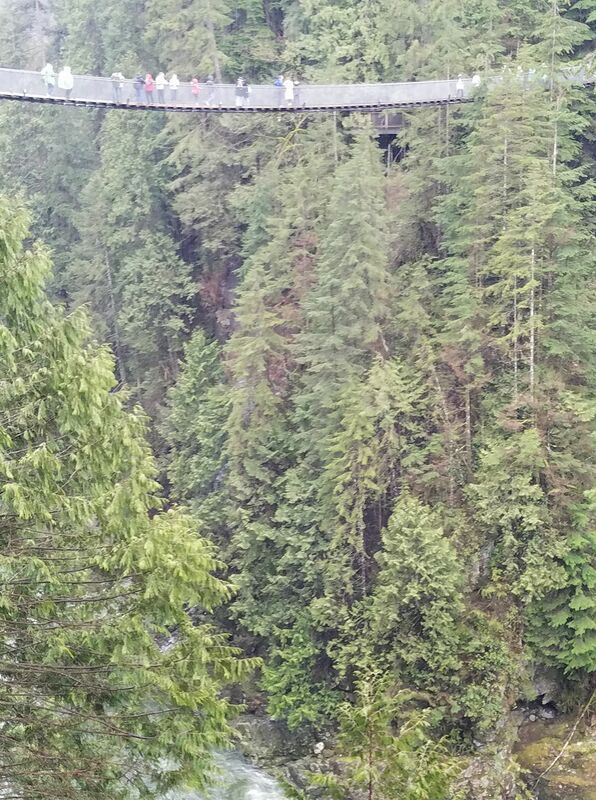 The Capilano Suspension Bridge in Vancouver is a rickety span that hangs 230 feet above the water below. 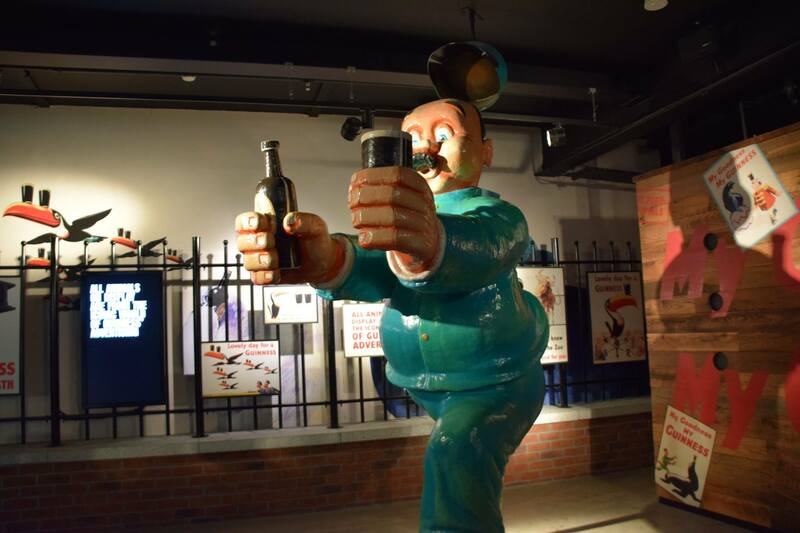 Residents and tourists alike visit the park where it’s located, just for the opportunity to traverse it. 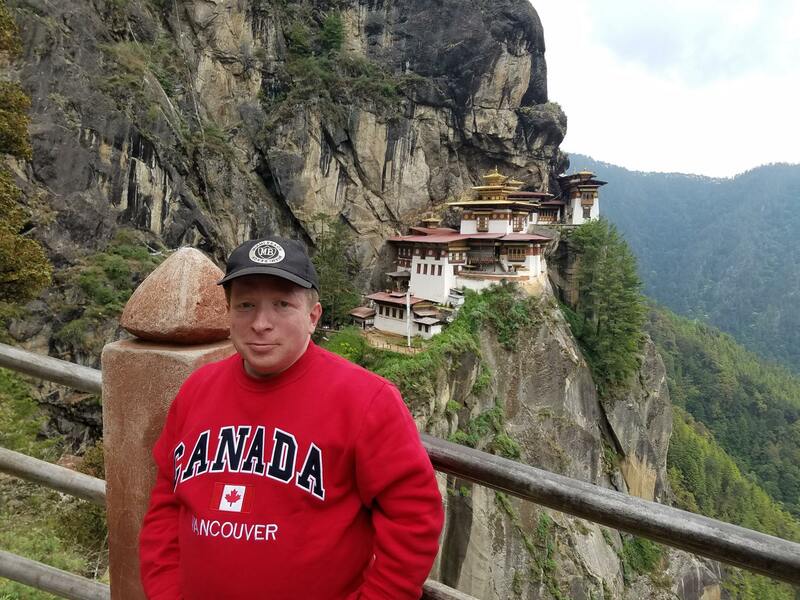 Me in front of the Tiger’s Nest Monastery in Paro district, Bhutan. I sang “Katmandu” in Kathmandu. And I’m excited to be able to say that. However, of the pair of songs that share the name of the city, I kind of wish I’d gone with the other one. So how did I come to find myself in Kathmandu, the Nepalese capital? 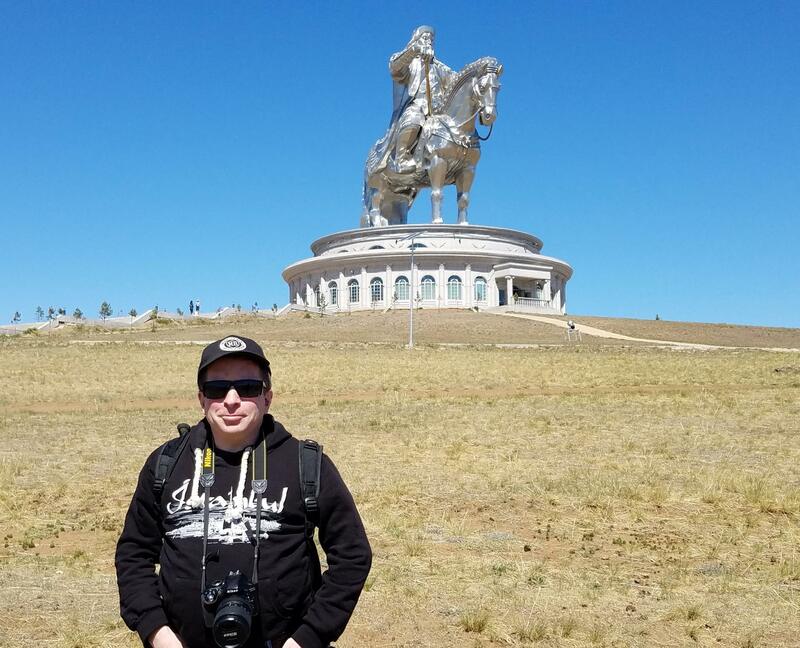 Well, I was alighting there on my way to Bhutan, during an excursion to Asia in May 2017. 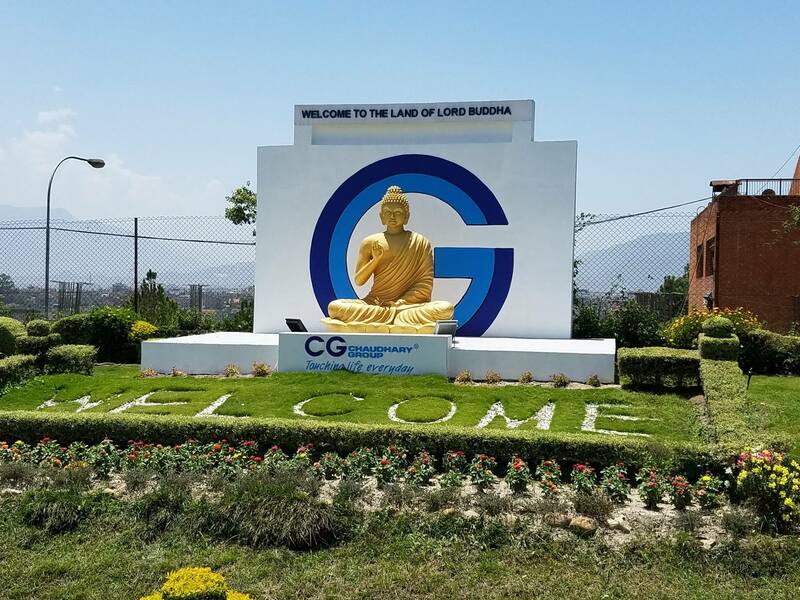 Kathmandu is merely one of several cities from which you can fly to Bhutan’s international airport, which is in the town of Paro; but if Kathmandu is your point of departure, your flight path will include a segment during which you can enjoy a view of Mount Everest from above. So I availed myself of that flight option, reasoning that it might be the only time I would ever glimpse Everest from any altitude. Now, Kathmandu itself is not the easiest of metropolises to reach — at least if you’re coming from North America. 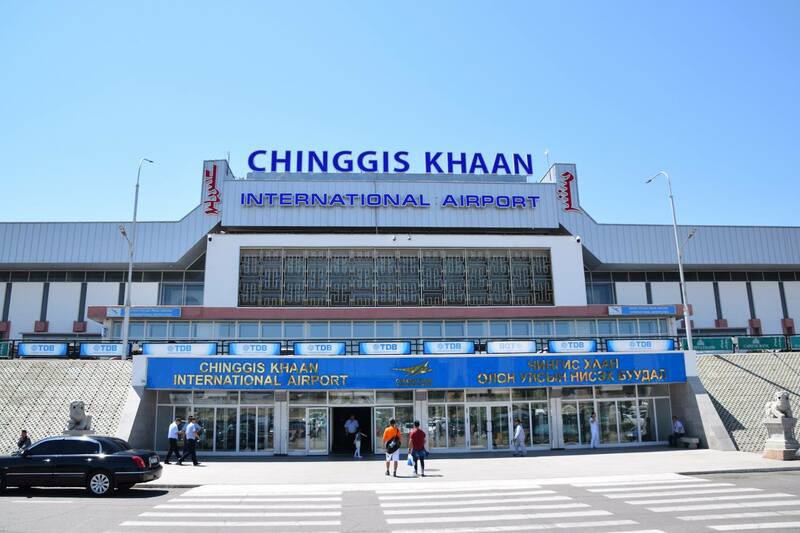 My itinerary was as follows: from my home base of New York City I flew to Beijing (which I had visited, and karaoked in, about a year earlier), and then after a couple of days there I proceeded to Bangkok. From Bangkok, I winged my way to Kathmandu. A scene adjacent to the tarmac at Kathmandu’s Tribhuvan International Airport. Prior to my arrival, my preconceived vision of Kathmandu was of an exotic and mystical city, although admittedly I knew little about the place. When I got there, I found the streets to be dirty and dusty, and the traffic chaotic. I wasn’t a fan. Maybe I didn’t give Kathmandu enough of a chance; I’m not saying I wouldn’t return there if the opportunity arose. But it didn’t make a stellar first impression on me. 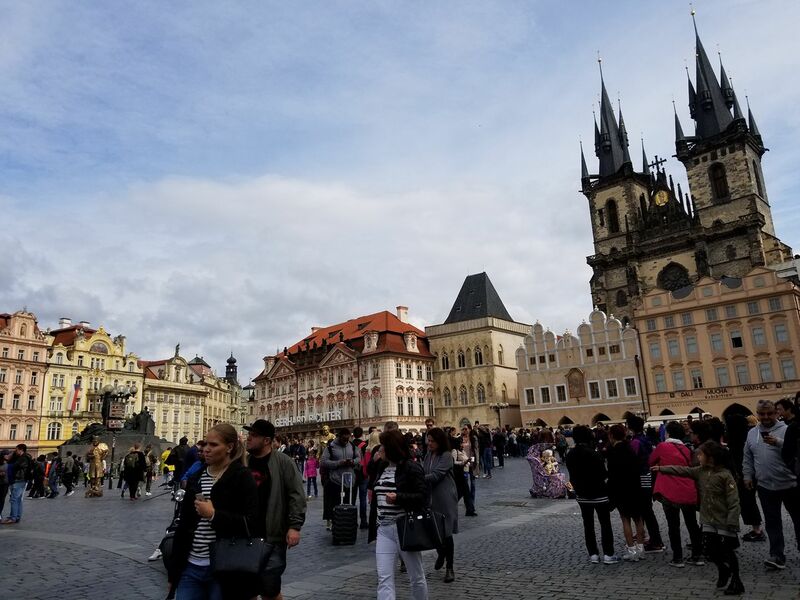 A view of Prague’s Old Town Square (Staroměstské náměstí). 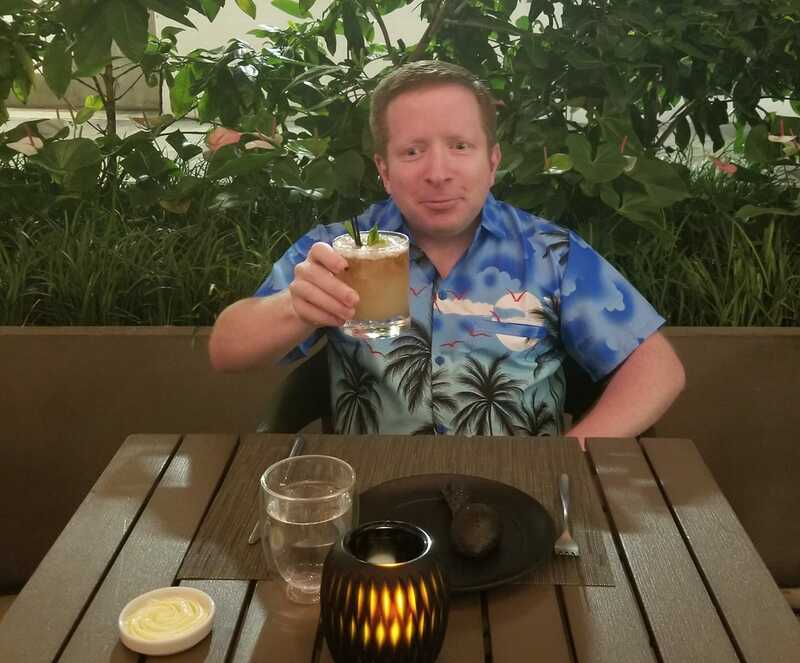 I’ve fallen a little behind — okay, a lot behind — in updating this blog to keep pace with my international karaoke appearances. 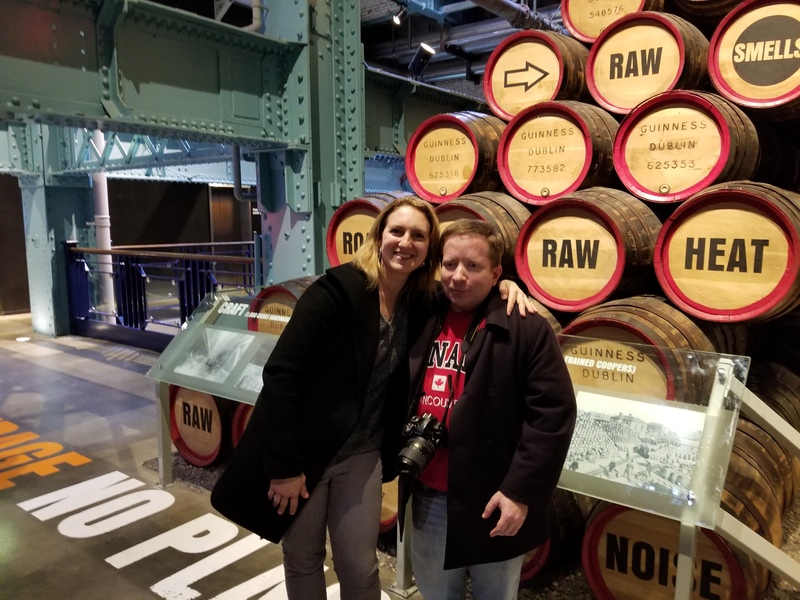 Prior to this post, my last blog entry chronicled my karaokeing in Dubai that occurred all the way back in January — which, at the time, brought the tally of countries on my World Karaoke Tour to 46. Since then, the Earth has completed a large portion of a revolution around the sun, and my country count has increased to 51. Part of the reason for my recent quietness on the writing front is that I’ve been travelling much more often on weekends. Most of those weekend excursions have taken me to various parts of my home country, the United States, as I pursue the accomplishment of karaokeing in all 50 U.S. states. That’s an accomplishment to which I’m well on the way; as of this writing, I’ve been to 40 of those 50 states, and karaoked in all 40 of them. 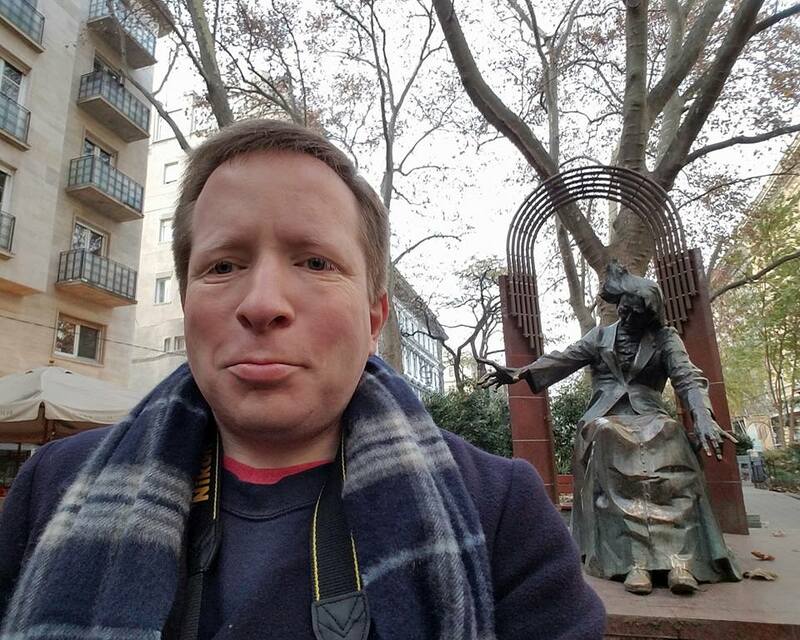 (I’ll recount all of my 2017 domestic travels in a post to be published in late February, 2018.) 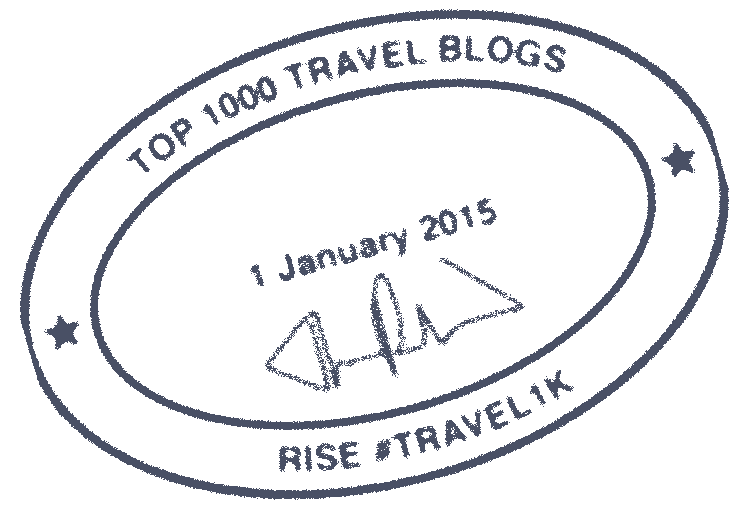 But since weekends have traditionally been my most productive part of the week for writing, my “50 states of karaoke” project has contributed to the slackening off of the pace of new posts appearing here at H-Bomb’s Worldwide Karaoke. This is a cheesy souvenir photo I purchased on the 124th floor of the Burj Khalifa. It was taken in front of a green screen, and the background was then superimposed. 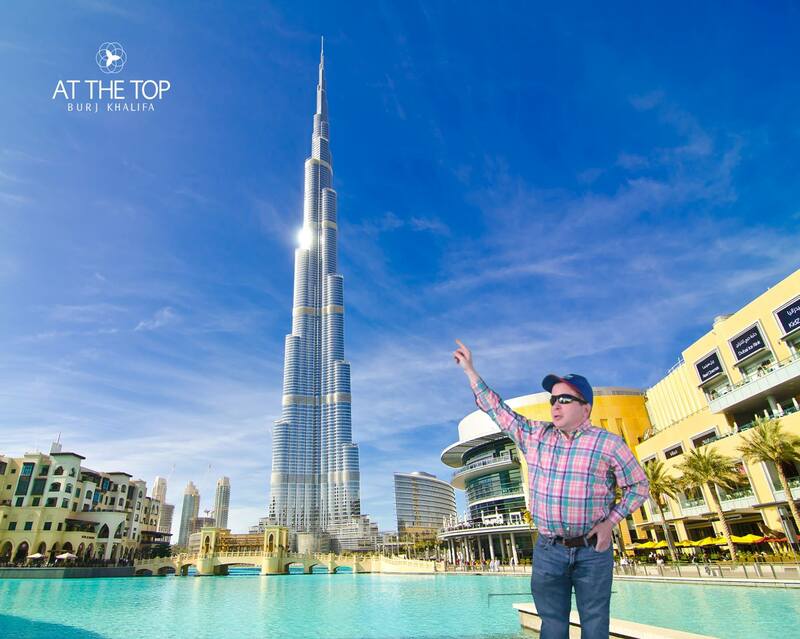 Rising over one-half mile into the Dubai sky, the Burj Khalifa is currently the world’s tallest building, a superlative it’s claimed since 2008. (Sources disagree on the precise extent of the Burj Khalifa’s verticality; depending on which website you ask, its height is either 2,717 feet or 2,722 feet. Regardless, it’s fair to say that this particular edifice is damn tall.) At this writing, an even more skyscraping building, imaginatively dubbed The Tower, is under construction across town in Dubai, and is slated to be finished in 2020. The elevation at which The Tower will top out has not yet been determined, but is expected to exceed that of the Burj Khalifa. Both the Burj Khalifa and The Tower, however, will be dwarfed by the Jeddah Tower in Jeddah, Saudi Arabia — also on target for completion in 2020 — which is planned to ultimately soar to 3,307 feet above ground level. That’s a full kilometer! 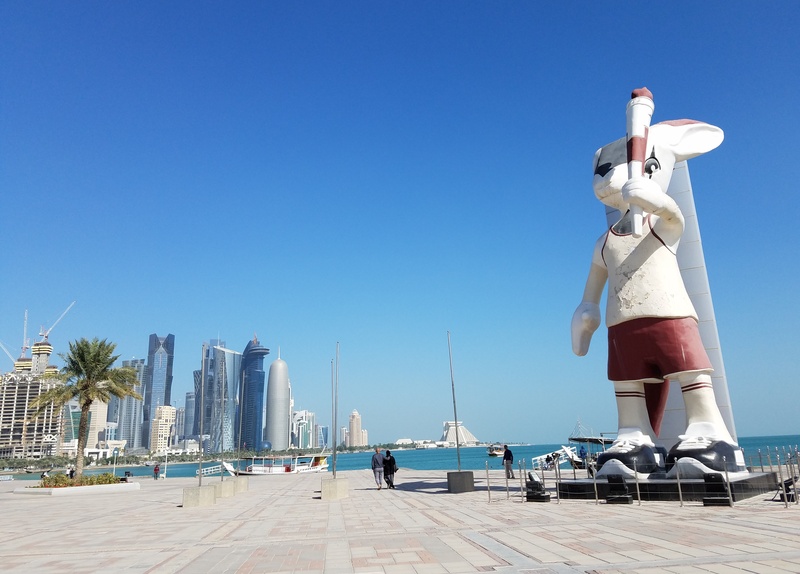 On Doha’s waterfront stands this statue of of Orry Oryx, a mascot who was created for the 2016 Asian Games (which were held in Doha). An oryx is a type of antelope. What’s the correct way to pronounce “Qatar”? Prior to my brief visit to that tiny nation on the Arabian peninsula, I’d been under the impression that the proper pronunciation was something approximating “Cutter.” But when I was aboard my Qatar Airways flight from Amman, Jordan to Doha, Qatar in January 2017, the narrator of the safety video that was played before takeoff pronounced the name of the airline as “Kah-TAHR Airways” — thus creating an uncertainty in my mind. So I chatted up a couple of the flight attendants to discuss this issue. Those FA’s, residents of the nation in question, agreed with their employer’s video and told me that they too recite the name of their homeland as “Kah-TAHR.” While internet research reveals a continued divide on this issue (see, for example, the results of this google search), I’ve adopted the pronunciation adhered to by Qatar’s flag airline — and by actual Qataris who work for that carrier. I was jonesing to see Petra. Indiana Jonesing, that is. 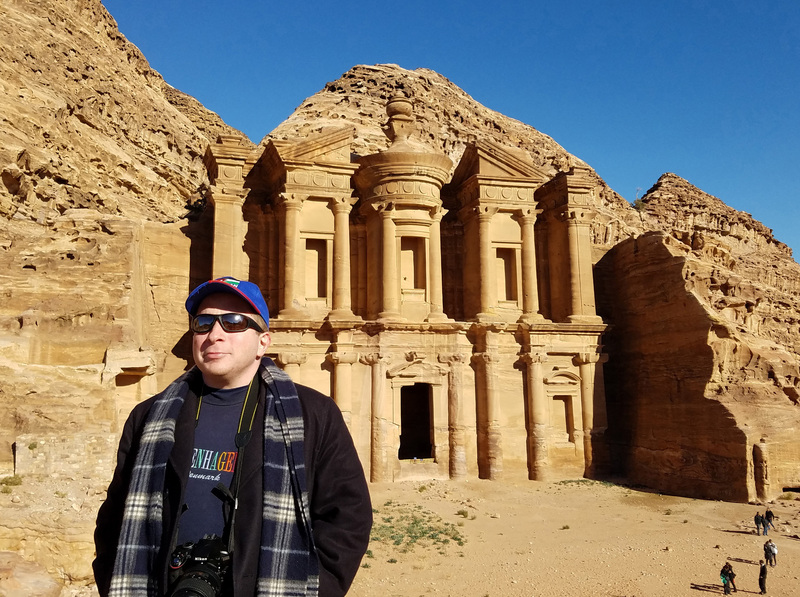 Me in front of the Monastery (Al-Deir) at Petra. 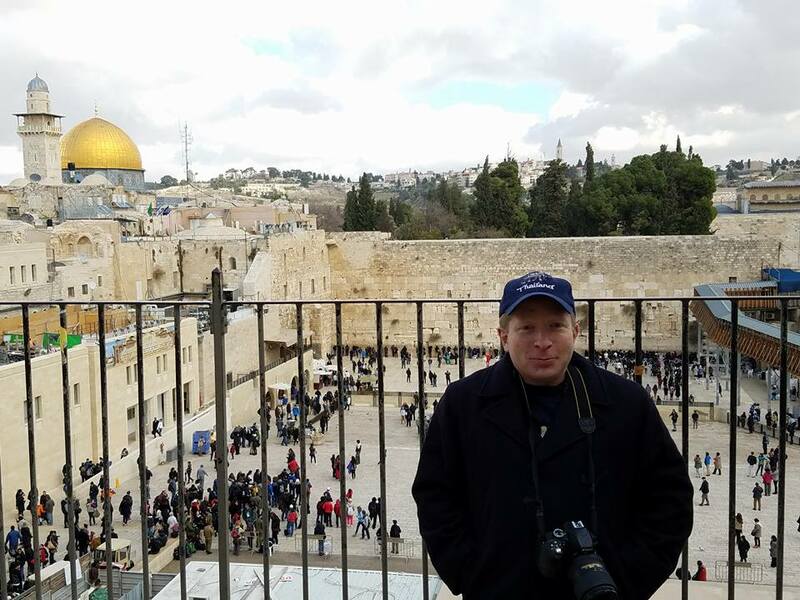 On the first day of 2017, a taxi ferried me from Jordan’s capital city of Amman to Petra. You may wonder why I’d arranged for a taxi to cover the approximately 150 mile driving distance between Amman and Petra, when an inexpensive bus serves the same route. Well, the only bus between the two cities that runs in the Petra-bound direction departs from Amman daily at 6:30 a.m. I’m so not a morning person, and waking up sufficiently early to catch a bus at 6:30 in the morning was a non-starter for me — particularly given that the night prior to my departure for Petra was New Year’s Eve, and I’d been up fairly late ringing in the new 12-month period. So I’d said ixnay to the bus and decided instead to embark on the longest taxi ride of my life. It wasn’t bad, though; I was treated to some pretty scenery along the way, and my taxi had free wi-fi! What could have been an at-times monotonous ride flew by with the help of my constant Facebooking and Instagramming. 🙂 Moreover, I became excited as we began to pass a series of road signs that marked the diminishing distance to my destination. 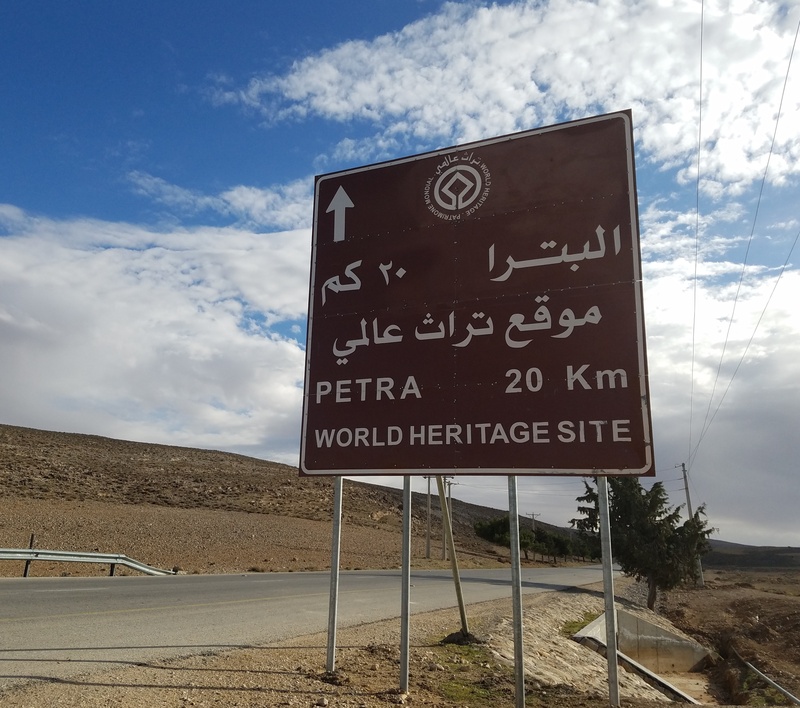 This sign informed me that only 20 kilometres now separated me from Petra!